Fela Anikulapo-Kuti has died of AIDS-related reasons and heart failure. According to the article by Chido Nwangwu in USAfrica ONLINE, he died on Saturday August 2, 1997 after several weeks of illness at the age of 58. "The immediate cause of death of Fela was heart failure but there were many complications arising from the Acquired Immuno-Deficiency Syndrome,'' Olikoye Ransome-Kuti, a medical doctor and Fela's older brother told a news conference in Lagos on Sunday August 3, 1997. Before his death, Fela refused treatment for his deterioratinghealth. He rejected both Western and traditional Nigerian medical services insisting it was on grounds of "principle." Even in this most detailed Fela's discography in the world, Fela's disks and songs have not been tracked down completely. In particular, I expect more songs, singles, EPs, and LPs be discovered for his early days in the 60's. I thus welcome your addition and correction for the discography (Toshiya Endo). - This recording was tracked down by Ray Templeton. 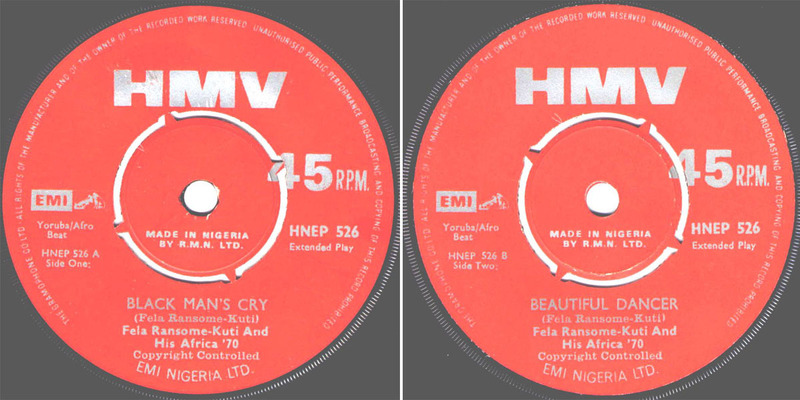 The recording numbers for 'Fela's Special' and 'Aigana' are 2966 and 2967, respectively, in the Melodisc file. This information was provided by Dr. John H Cowley (through courtesy of Ray Templeton). According to Duro Ikujenyo, Aigana was not written by Fela but by Victor Olaiya and it was quite a popular highlife tune in it's time. Recently the disk was finally tracked down by the (German) ethnomusicologist and Highlife researcher Dr. Markus Coester. The sound of those two tracks is smokey and premature, but very attractive (see the Soundway compliation CD set below). 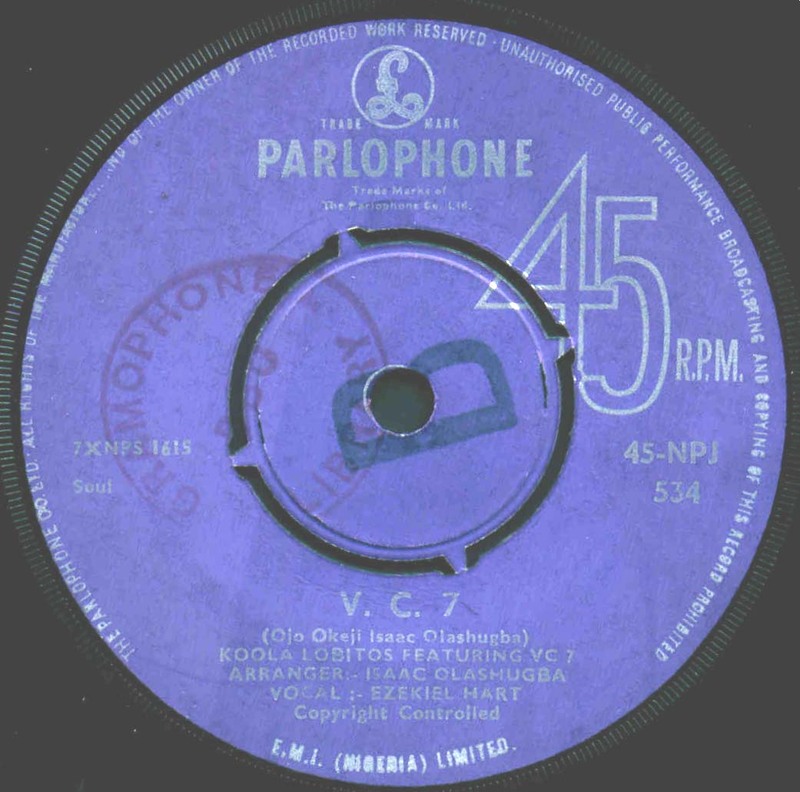 He told me that this Melodisc 78 rpm record came out in late 1959 or early 60, the songs were recorded in London in later part of 1959. 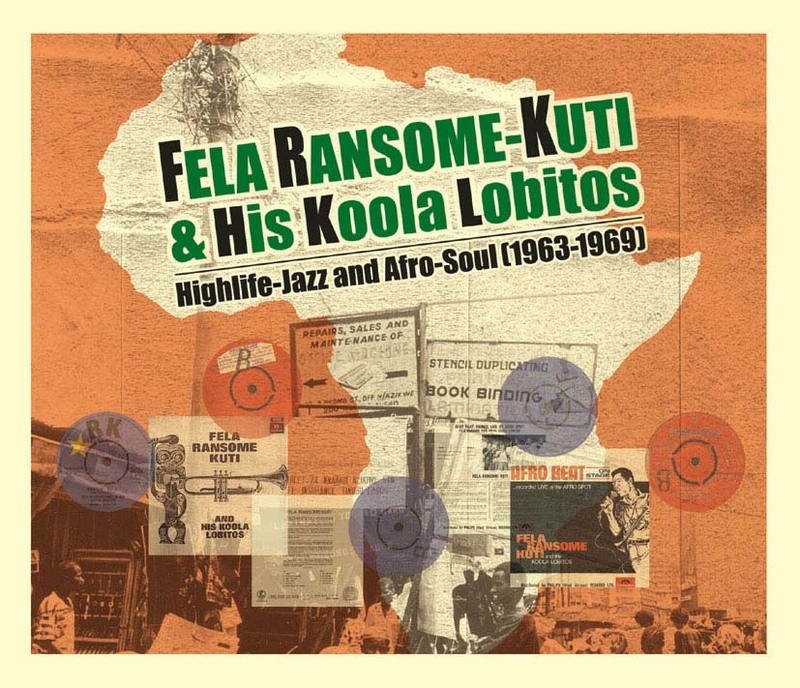 More on Fela's first band, the Koola Lobitos in England, little of which is known now, but also on the second Koola Lobitos in Nigeria, will be revealed in the forthcoming his book on Highlife soon. 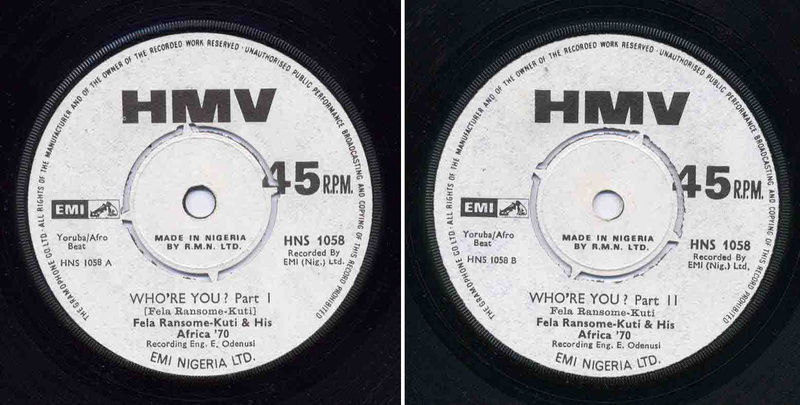 - These are additional Fela's titles recorded at the same session as Melodisc 1532, although they have never been issued. The recording numbers for 'Highlife Rakers Calypso No.1' and 'Wa Ba Mi Jo Bosue' are 2968 and 2969, respectively, in the Melodisc file. This information was provided by Dr. John H Cowley (through courtesy of Ray Templeton). 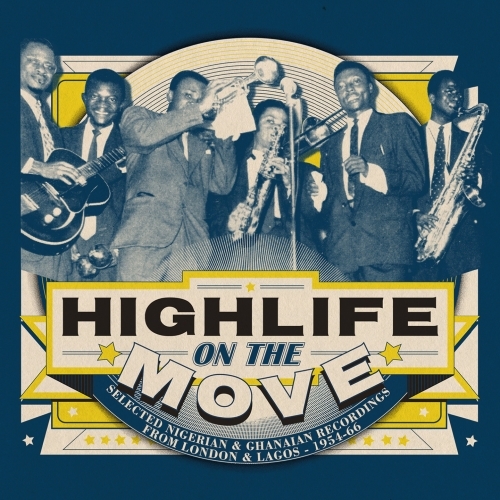 -- By the extensive efforts by Markus Coester, this 2CD set (also released in the forms of vinyl and digital MP3) finaly revealed the very first recordings of Fela Ransome-Kuti with the Highlife Rakers. Compare Fela's version of "Aigana" with its original track "Anyin Ga Na" by Victor Ola-Iya. The CD set also includes Koola Lobitos's rare track "Nigerian Independence" on the RK label. -- Picture taken from 'Unseen Vogue: Evening Looks and All That Jazz' (1961). Photographed by Brian Duffy and printed by The Art Group Limited, London. The note says: Hardy Amies, probably best known for dressing H. M. the Queen, designed the sleevless top and embroidered it with tiny glass beads. John Cavanagh, another British designer of the era, created the tapered evening pants. The background music is supplied by 'Koola Lobitos' ('The Cool Cats'). This version was not published. This picture was discovered by Michael E. Veal (Thanks, Michael!). 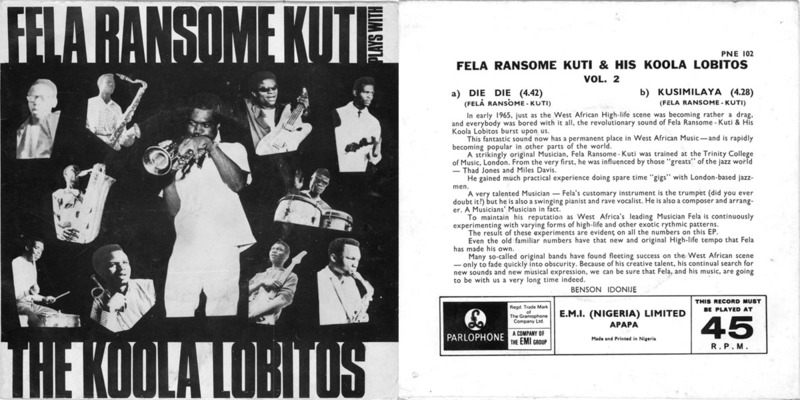 You can see Fela on trumpet and J. K. Braimah on guitar in the London edition of Koola Lobitos. 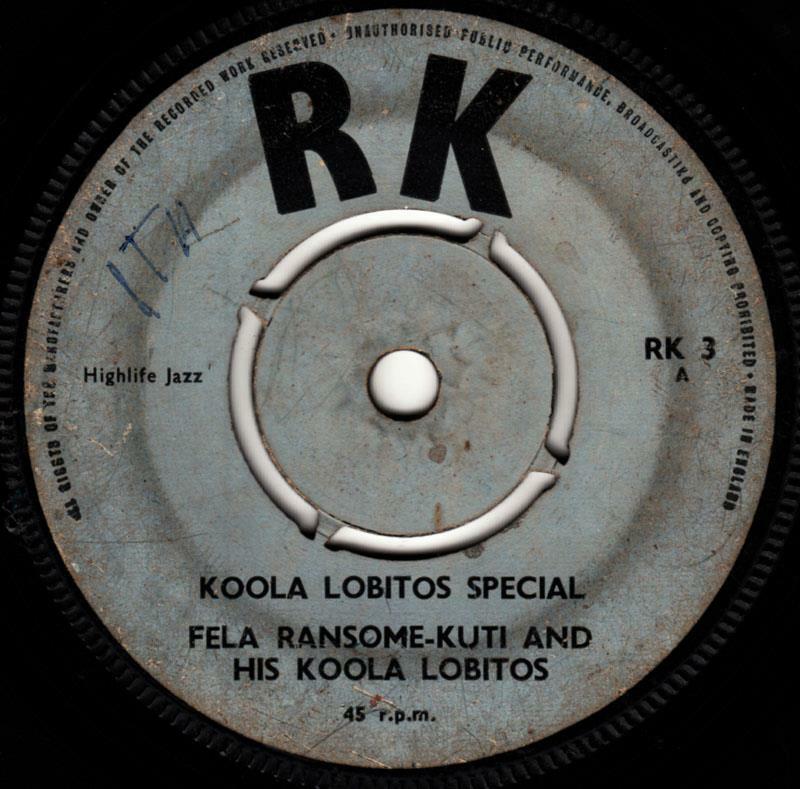 -- Fela changed the name of his band from Highlife Rakers to Koola Lobitos in August, 1960, and "New" Koola Lobitos recorded the first three singles on the RK label in UK in1961. In the article 'Koola Lobitos... The beauty of melody' by Benson Idonije (Oct. 13, 1999, The Gurardian) , Idonije wrote "The first tradition of the Koola Lobitos was formed in England in the late fifties, featuring foreign musicians, especially in the horn section level; and Nigerians at the rhythm section level featuring Wole Bucknor on piano. Some of the singles that emanated from the group in terms of studio recording were songs such as Bonfo; Fere; Lobitos Special among others." However, Dr. Beko Ransome-Kuti (Fela's brother), insisted that Fela did not release any songs while they were in England. 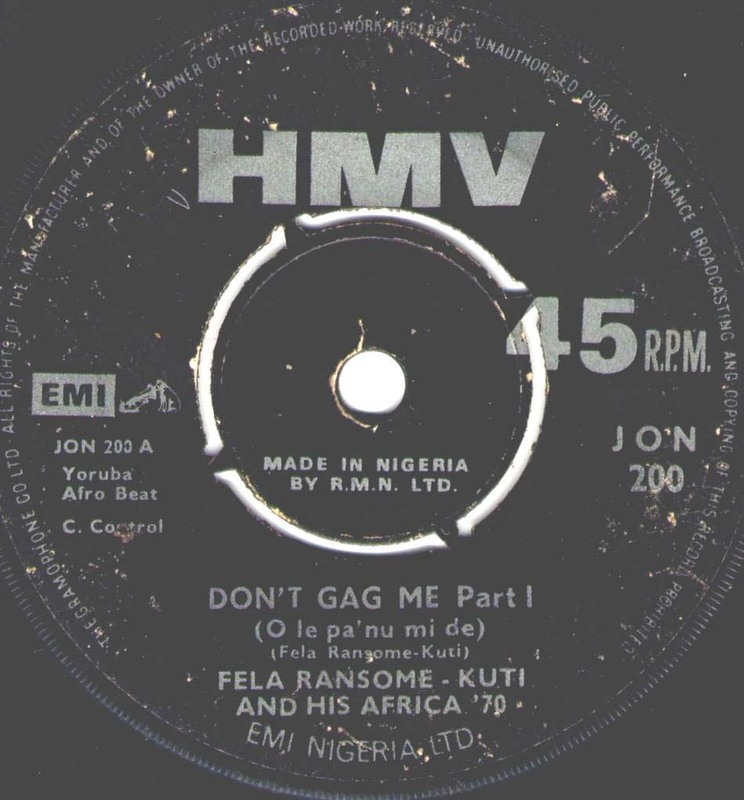 Therefore likely, these tracks were recorded and manufuctured in London, but then Fela's mother arranged them to be shiped and marketed in Nigeria. Information given by Michael E. Veal, Olajide Bello, and Uchenna Ikonne. -- Now Uchenna Ikonne added new speculation. In his autobiography African Rhythms, American jazz pianist Randy Weston vividly recalls meeting Fela during his first trip to Nigeria for the AMSAC (The American Society of African Culture) Festival held in Lagos in December 1961. 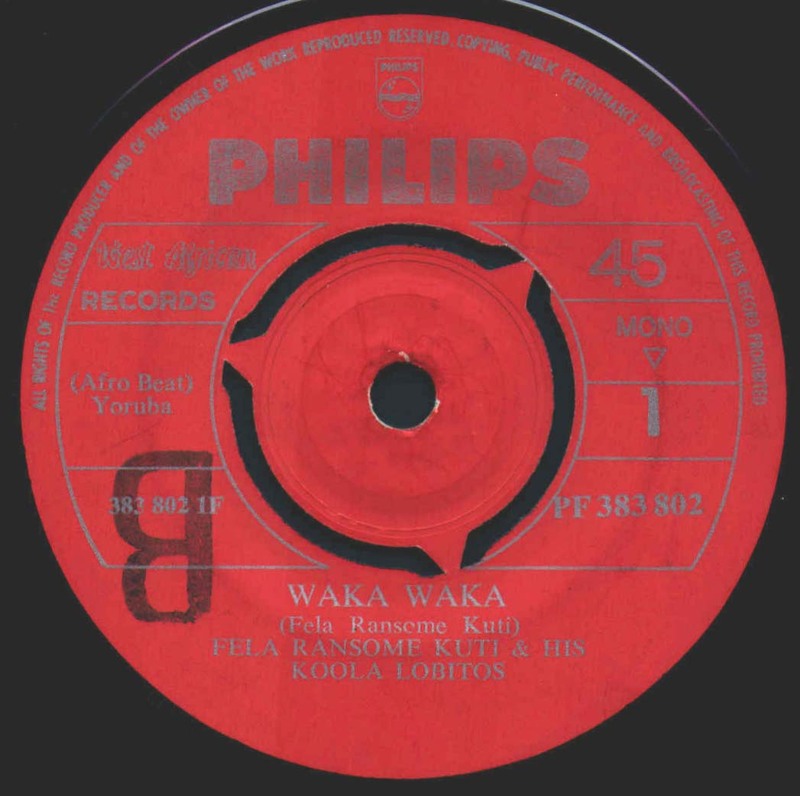 If Weston's recollection is reliable, then it is possible that Fela came home from London for the Christmas holidays in 1961, and this visit might have coincided with the release of RK1-3. -- Image and information, courtesy of Dub Store Records in Tokyo. -- According to Uchenna Ikonne, "Biko" appears to be a partial cover of Dr. Victor Olaiya's "Moonlight Highlife." -- This is a record that Benson Idonije has made reference to in a few of his articles (for example, see National Mirror web site). According to Idonije, this was a a 4-track album of straight jazz that Fela brought with him when he came back from London in early 1963. The recording members were not known, but since Fela formed Fela Ransome-Kuti Quintet (#1) in London in 1962, it was most likely FRKQ. 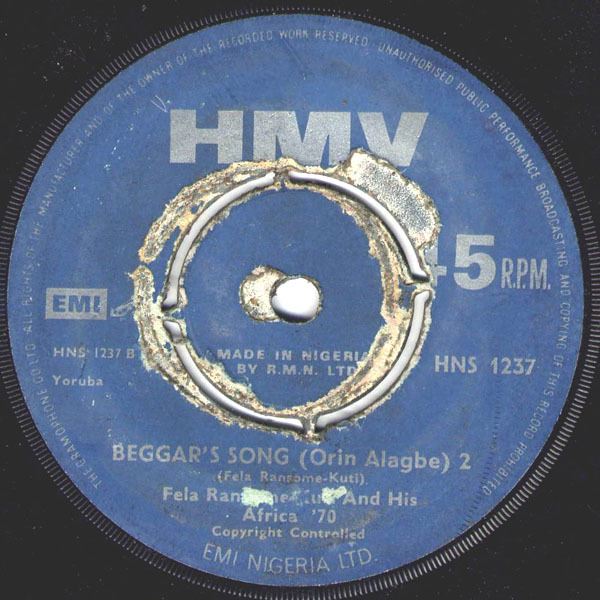 This recording was never commercially released, but it did get significant airplay on the Nigerian Broadcasting Service. Information given by Uchenna Ikonne. -- The personnel of Fela Ransome-Kuti Quintet #2 (formed in Nigeria in mid-1963) is F. Ransome-Kuti, trumpet; Medonal Amaechi, guitar; E. Ngomalloh, bass; T. Adekoya, drums; Ayinde Folarin, conga: B. Idonjie, supervisor. Information and image, courtesy of Michael Kieffer. -- This information was provided by Michael Kieffer. Image, courtesy of Michael Kieffer. 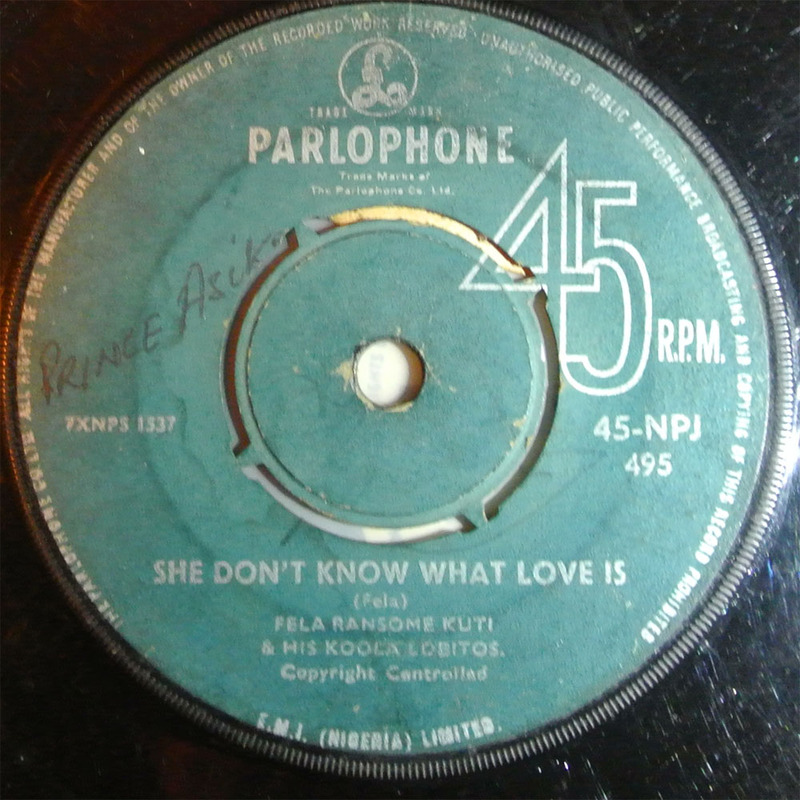 -- This 45 was discovered at a fleamarket in Amsterdam by Carlo C. Brander. 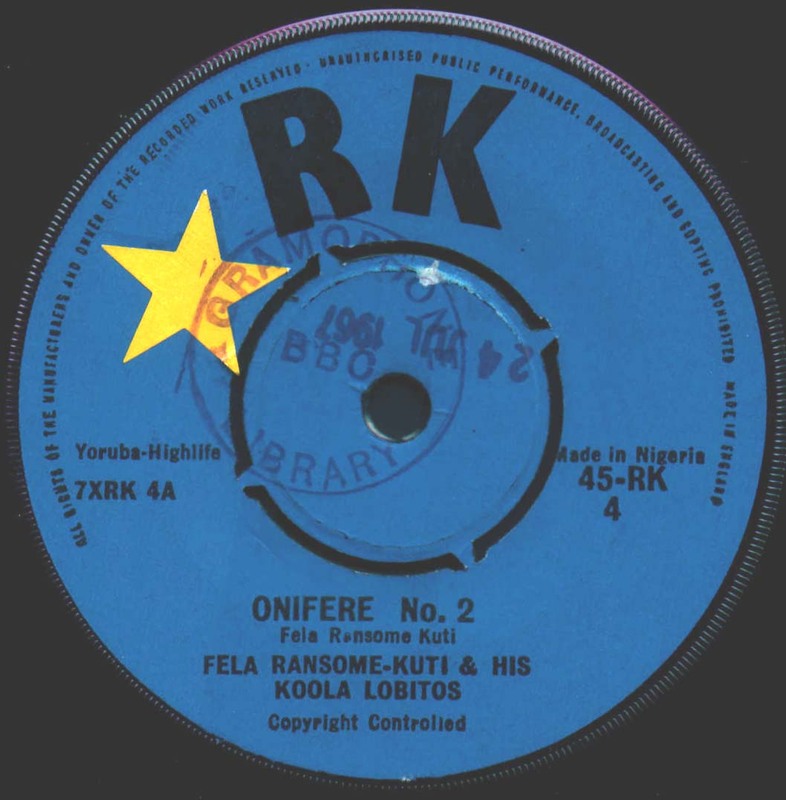 -According to Uchenna Ikonne, the three singles (RK4-RK6) were released at the same time in late 1965 on Fela's RK label. While the text around the rim of the labels says "Made in England," it would seem that it's because they re-used the graphic template from the earlier RK releases. 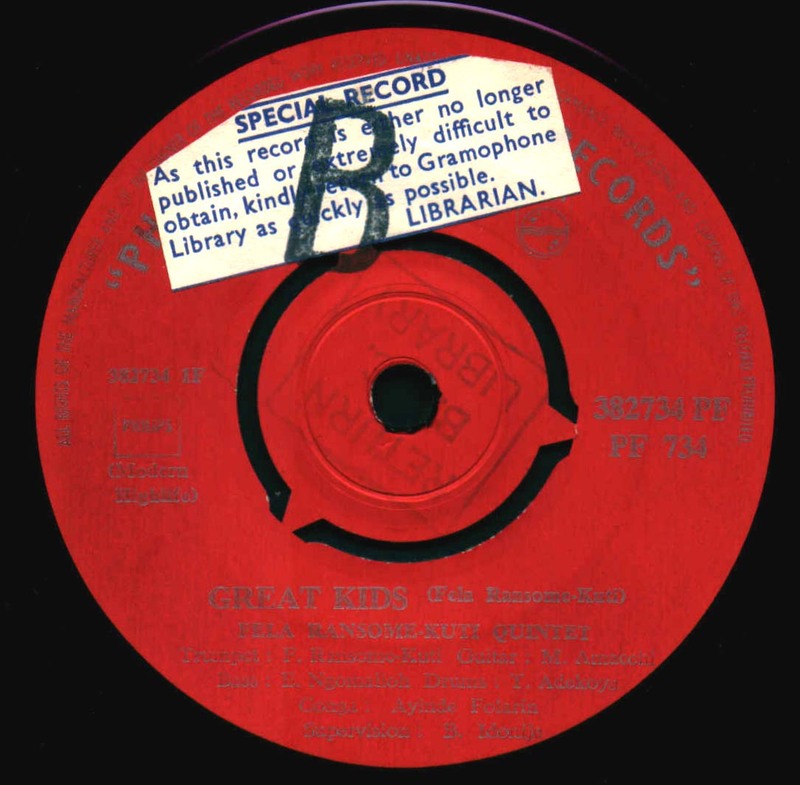 But the colors of the labels and the typeface with which the text is printed suggests that the records were probably manufactured at the Parlophone Records plant which opened in Nigeria in 1962. Information given by Uchenna Ikonne. -- This new batch of Koola Lobitos recordings were recently discovered by Michael Veal, who obtained them from Martin Perna of Antibalas. They were recorded in Lagos for Voice of America radio broadcast. Surprisingly, four of these tracks are previously unknown. At the moment, it is not clear if these tracks or additional tunes from this session were released in a disk format. Anyway the obtained sound files are in amazingly good sound quality! 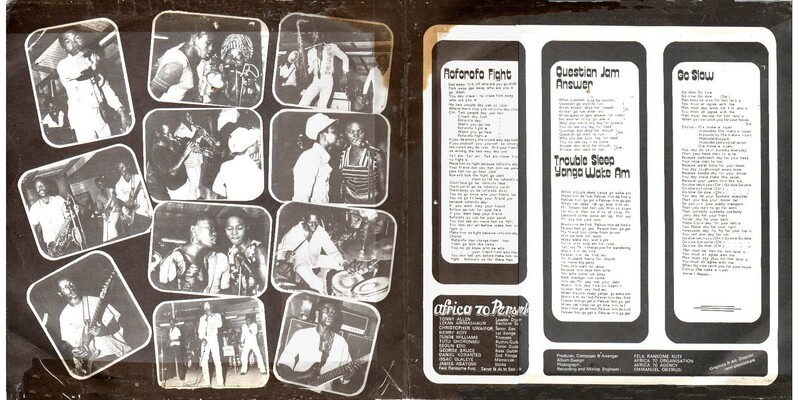 The image of the container and Fela's great interview (VOA interview with Fela Ransome-Kuti Lagos, November 9,1967) were available from the African Music Treasures blog site before, which is deleted now. -- Year of the release was confirmed by Uchenna Ikonne. -- Thanks to Duncan Brooker for the information. 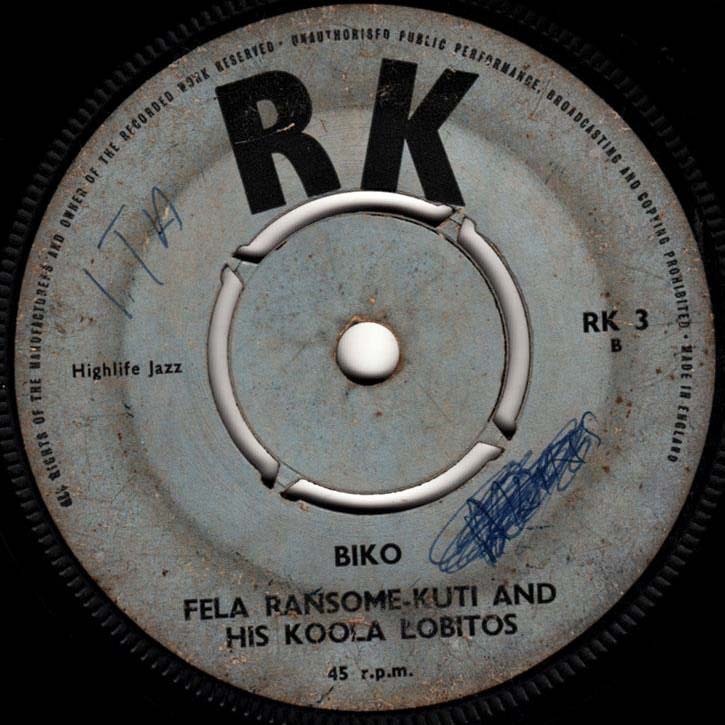 -- This intersting disk, where Fela plays Hancock's track, was discovered by Olajide Bello in Oshodi, Lagos. 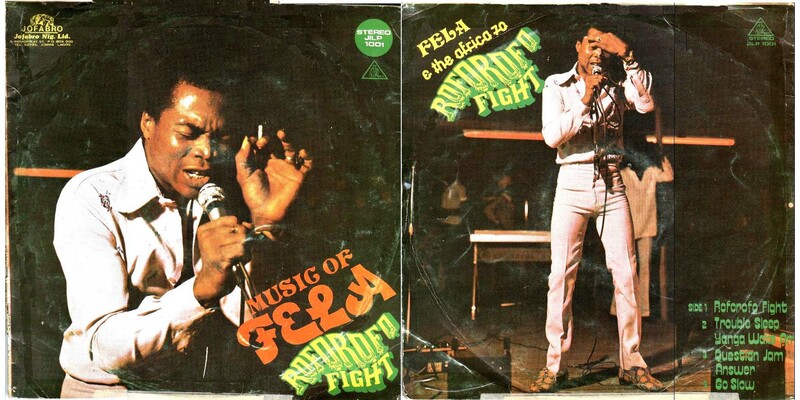 -- Both sides are arranged by Isaac Olashugba, but apprearance of Fela is not confirmed. 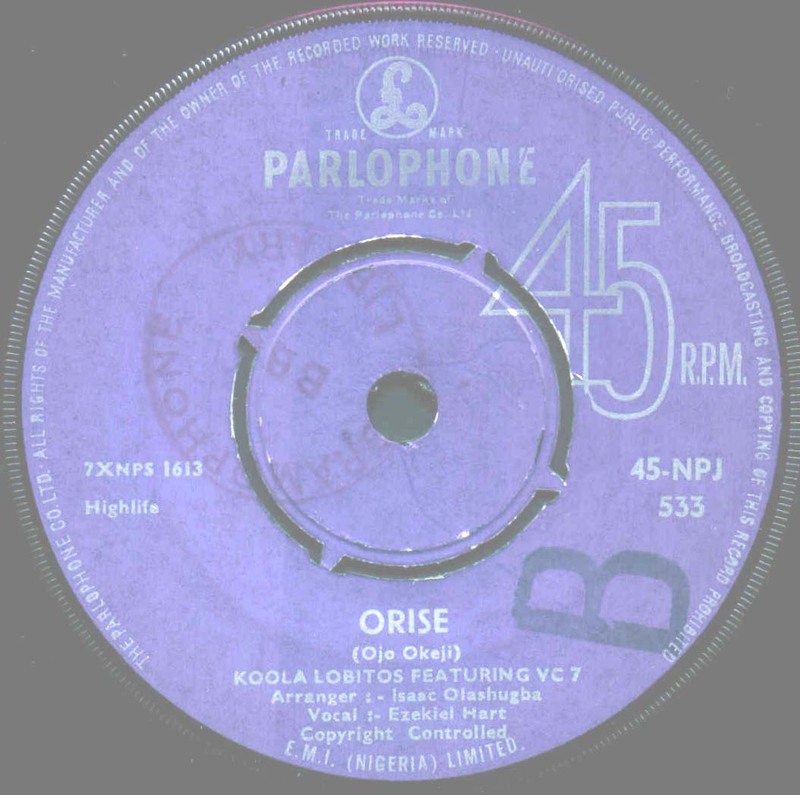 'Orise' is writen by Ojo Okeji, and vo. by Ezekiel Hart. 'Eke' is writen by Isaac Olashugba, and vo. by VC7. Information and image, courtesy of Michael Kieffer. 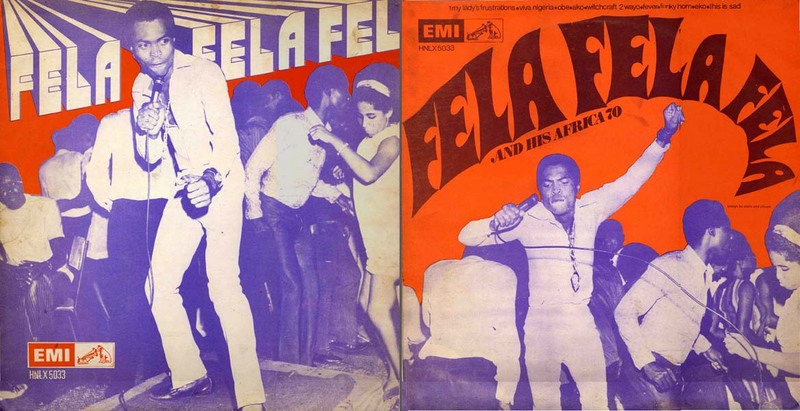 -- Both sides are arranged by Isaac Olashugba, but apprearance of Fela is not confirmed. 'V. C. 7' is writen by Ojo Okeji and Isaac Olashugba, and vo. by Ezekiel Hart. 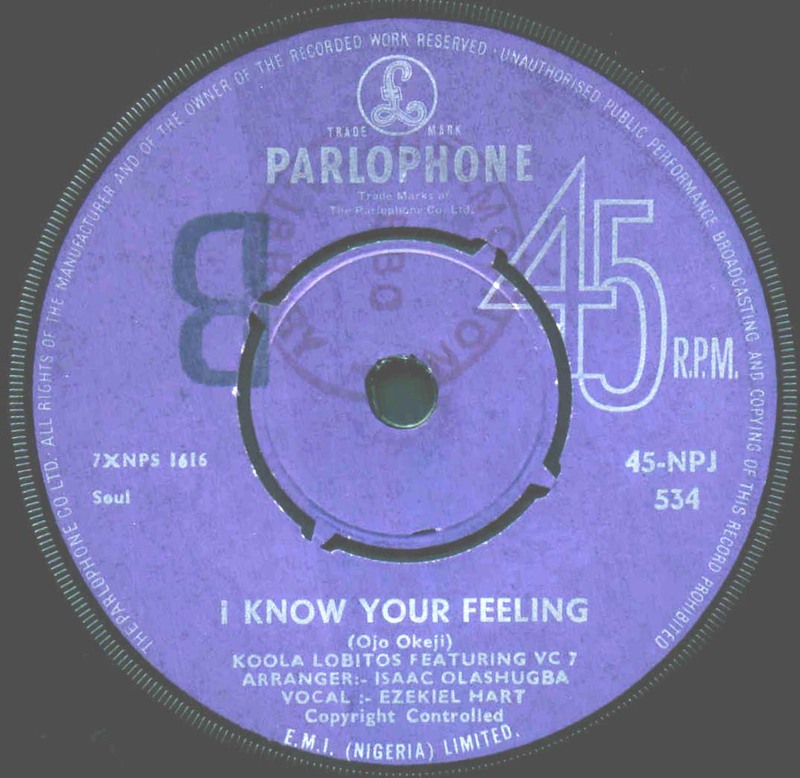 'I Know Your Feeling' is writen by Ojo Okeji, and vo. by Ezekiel Hart. Information and image, courtesy of Michael Kieffer. 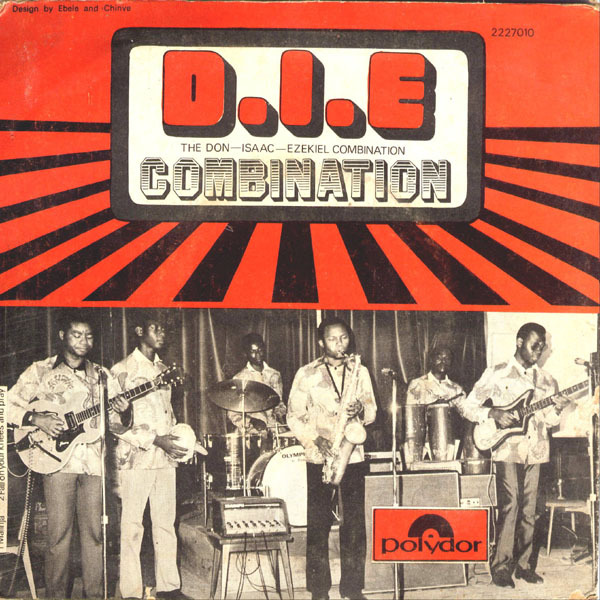 Isaac Olashugba and Ezekiel Hart later formed a group called D. I. E. Combination, and released a 45 from Polydor in 1972 ('Ire b/w Amalinja' Nigeria Polydor 2227210 POE). Here is the jacket of the 45 (by courtesy of Miles Cleret). 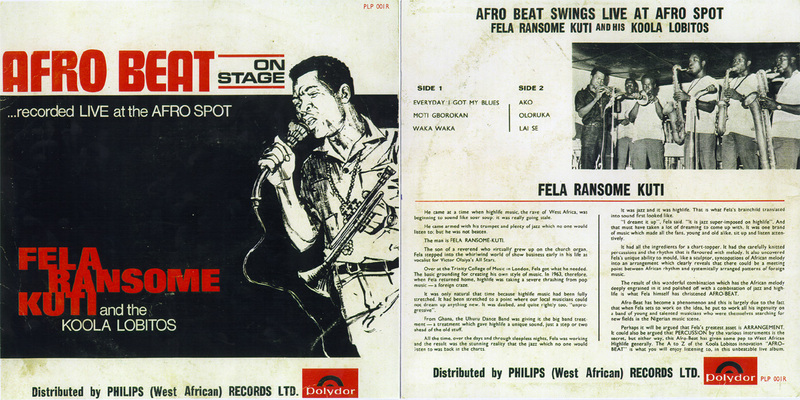 -- According to Olajide Bello, it is attributed to "Fela Ransome-Kuti and his Koola Loobitos at a night club date"
-- The photo of the jacket appears here by courtesy of Olajide Bello, Miles Cleret and Andrew Symington. According to Uchenna Ikonne, "Die Die" and "Kusimilaya" could be "Labons Ke Le Le" and "Ekuro La Labalu Ewa", respectively, both of which were contained in the CD set of "Fela Anikulapo Kuti / Complete Works Of Fela Anikulapo Kuti" (Evergreen Musical Company, no suffix). - This track is contained in the CD set of "Fela Anikulapo Kuti / Complete Works Of Fela Anikulapo Kuti" (Evergreen Musical Company, no suffix) under the title of "Yabomisa". According to Olajide Bello, this is a Victor Olaiya song that Fela re-recorded. It was recorded a few times by Victor Olaiya and in a great version with the Late E.T. Mensah as well. Victor Olaiya said (to Olajide Bello) that Fela covered a few of his songs when he left his band the Cool Cats to go to England for his A-level examinations and then the Trinity College of Music. Two of these songs would be Yabomisa and Aigana. - Possible release of this track as a single was suggested by Uchenna Ikonne. -- Fela's band went into a second phase of Koola Lobitos in May, 1965. The members included Tony Allen (drums), Ojo Okeji (bass), Yinka Roberts (guitar), Isaac Olasugba (sax), Tunde Williams (trumpet), Eddie Aroyewu (trumpet), Tex Becks and Uwaifo (tenor sax), Fred Lawal (guitar) et al. 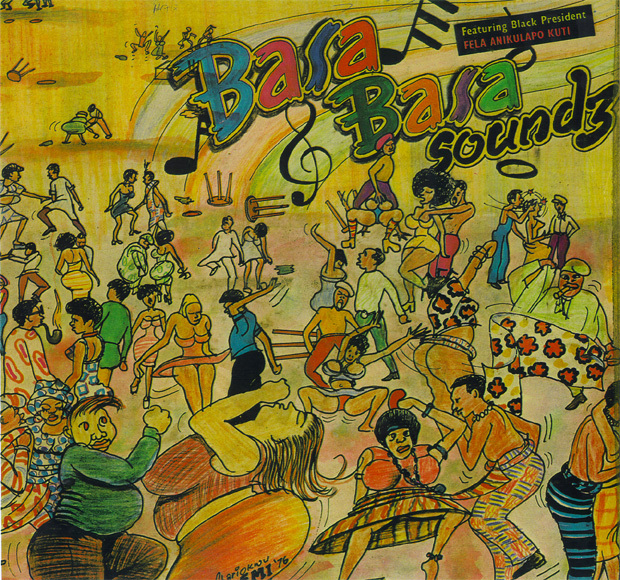 This is a compilation album of Koola Lobitos' singles and probably Fela Kuti's first LP. They play hybrid music of Highlife, Jazz and Soul with lots of trumpet by Fela (I thank T. A. Thomas for the tape copy). All the tracks except for 'Alaba's Delight' (by J. O. Araba) were written by Fela, and notes by Benso Idonije were shown on the jacket. Thanks to Miles Cleret for the jacket. -- This LP was probably released in 1968, before Fela moved to Philips. Six out of these tracks have been re-issued on the CD, The '69 Los Angeles Sessions (CD France (2001), Barclay 549 461-2). 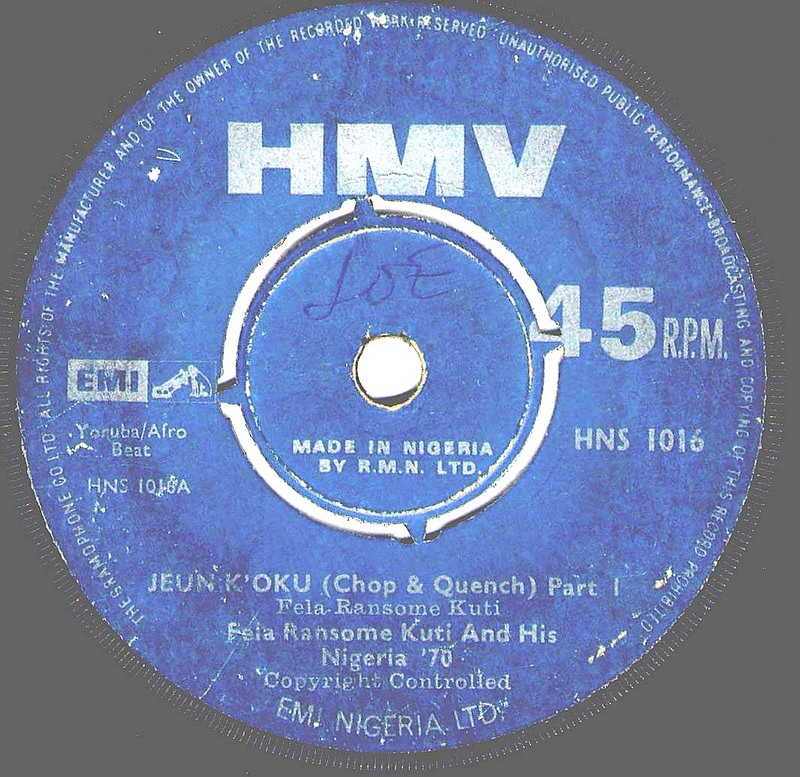 The tracks contained in the CD are 'Highlife Time', 'Omuti Tide (Omti)', 'Ololufe Mi (Ololufe)', 'Wadele Wa Rohin (Wa Dele)', 'Laise Lairo (Lai Se)', 'Wayo (Mi O Mo) '. The reasons for the change of the titles are unclear, but 'Mi O Mo' is clearly different from 'Wayo' contained in 'The '69 Los Angeles Sessions', which they call the 2nd version! According to the note for the CD, 'Omuti Tide', 'Ololufe Mi' and 'Laise Lairo' are recorded in 1964, 'Wadele Wa Rohin' in 1965, and 'Highlife Time' and 'Wayo' in 1968. -- This album was referred to in the article 'Koola Lobitos... The beauty of melody' by Benson Idonije (The Guardian (Lagos), Wednesday, 13, October 1999). However, it was recently pointed out that this album may not have existed. Indeed, some of these tracks are likely from the above first album, and some others are singles from that period. -- According to Uchenna Ikonne, while "Onidodo Onimoinmoin" is a folk song that had been performed by a number of performers, this could be regarded as another Olaiya tribute because it was a popular item in the Cool Cats repertoire in the 1950s. 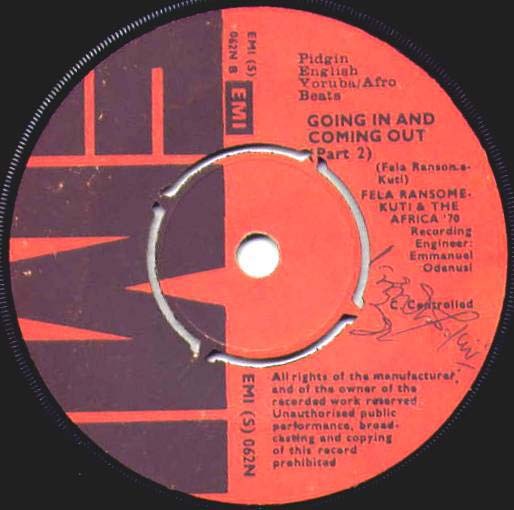 Note that Fela moved from EMI (Parlophone) to Philllips in December 1968. -- Live recordings at Afro Spot. The photos of the label and the jacket appears here by courtesy of Olajide Bello and Miles Cleret, respectively. Since the Afro Spot was opened in April 1969, this album should have been recorded in 1969, and released in 1969 after he moved from EMI to Phillips. All this consideration came from Uchenna Ikonne. 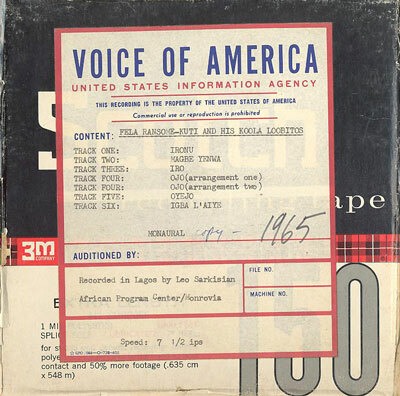 -- A three-CD set of extemely rare recordings by Koola Lobitos in Nigeria in the 1960s. This project has been carried out by Michael E. Veal, Yoshiki Fukazawa, and Toshiya Endo in cooperation with Michael Kieffer, Miles Cleret, T. Ajayi Thomas, Carlo C. Brander, Naotaka Doi, Ray Templeton, John H. Cowley, Johan Beadle, and Olajide Bello. -- Image, courtesy of Miles Cleret. 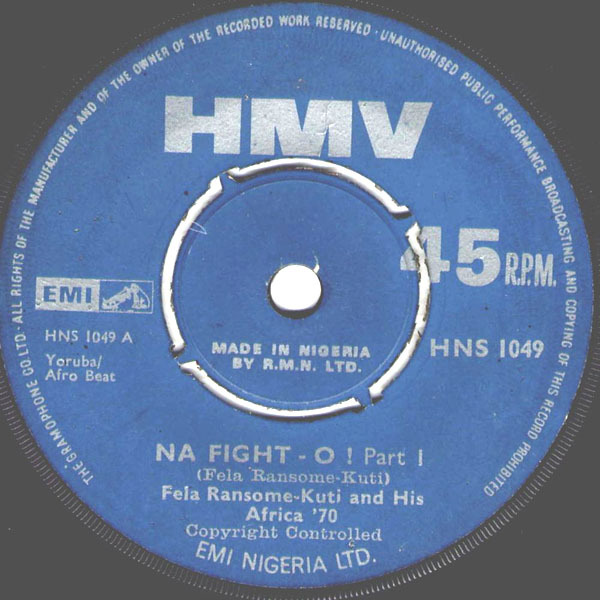 This is the first single released in December 1970 from Nigeria EMI with his new contract with EMI again. Note that he moved from EMI to Phillips in December 1968 and then came back to EMI again in December 1970. Fela changed the name of his band from Nigeria 70 to Africa 70 on January 1st, 1971. -- Prod. by Duke Lumumba. 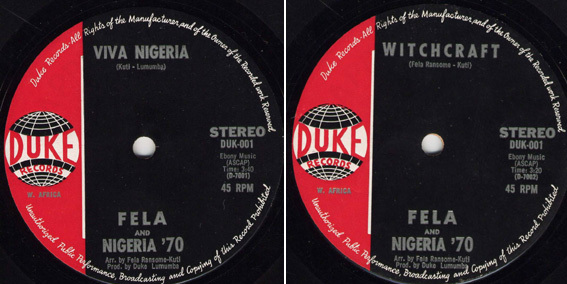 The names of the band on the records were originally Nigria 70, but later they were changed to Africa 70 (see the 1st issue with the name of Nigeria 70 and the 2nd one with the name of Africa 70 shown below). 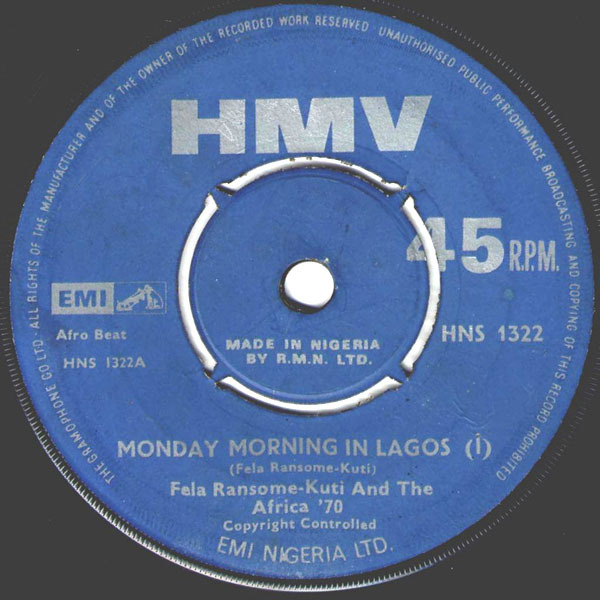 The recording session of this disk and others was held in February 1970, but a series of disks from this session were released as singles after Fela came back to Nigeria in March 1970. 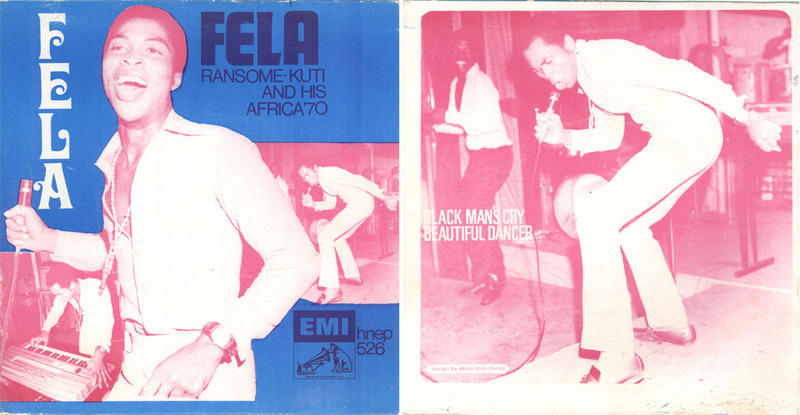 It is likely that the first issue with a credit of Nigeria 70 were released in 1970, and the one with a credit of Africa 70 was released in 1971 after his new contract with EMI. 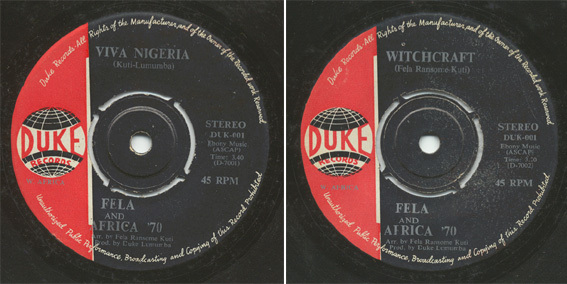 Indeed, there are two versions of the disks with the credit of Nigeria 70 (the first issue). The one with the credit of "FELA AND NIGERIA '70" and the other with "FELA NIGERIA '70" (no "and" between Fela and Nigeria '70) and the description of "Fela Ransome-Kuti appears by courtesy of Phillips (W. A.) Records Ltd.", indicating that Fela was still bound to Phillips by contract at that time (this information came from Paul Cleugh). These tracks were issued as a compiled album from EMI ("Fela, Fela, Fela") in 1971 and more later, included in the compilation CD, 'The '69 Los Angeles Sessions (CD UK (1993), Stern's STCD3005)'. The photos of the labels are shown here by courtesy of Miles Cleret. 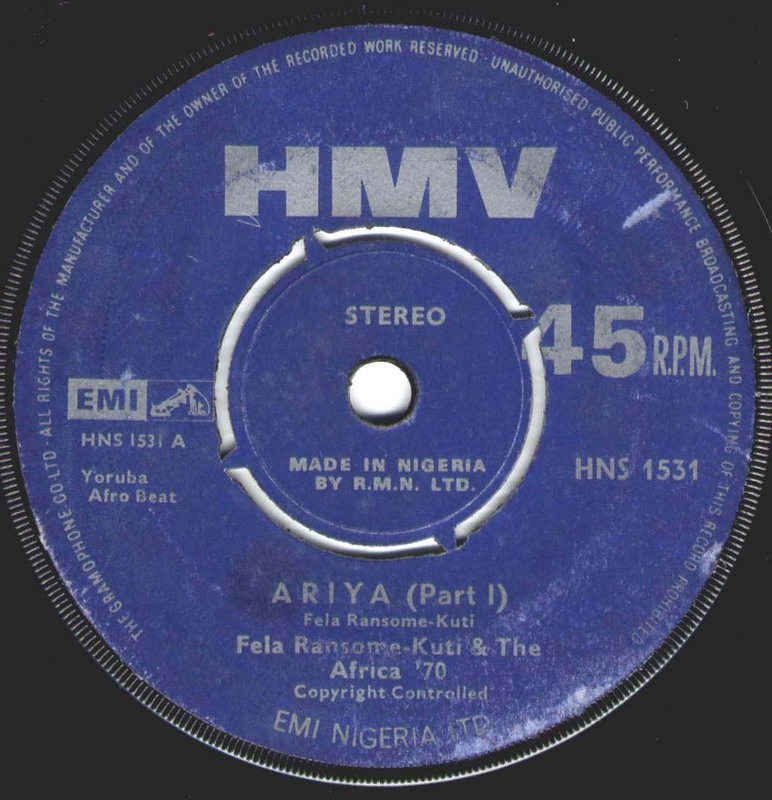 -- Now this song 'Viva Nigeria' revealed interesting aspects of Fela's politital stance at that time. Although Fela's stance against police, army, establishment, and neo-colonialism was always clear-cut, that on the domestic or inter-tribal conflict remained somehow vague. For example, he could not reveal his attitude on the situation that his brother, Beko, and his long-time enemy, Obasanjo were imprisoned by Abacha. Another example is this song. He wrote this song as a pro-government song during the Biafran war, although he later expressed his sympathy for Biafra. -- Prod. by Duke Lumumba. These tracks were later included in the compilation CD, 'The '69 Los Angeles Sessions (CD UK (1993), Stern's STCD3005)'. The photo of the label is shown here by courtesy of Miles Cleret. Ako b/w Ladies Frustration (7" Nigeria, The Duke Records DUK -005) -- Prod. by Duke Lumumba. 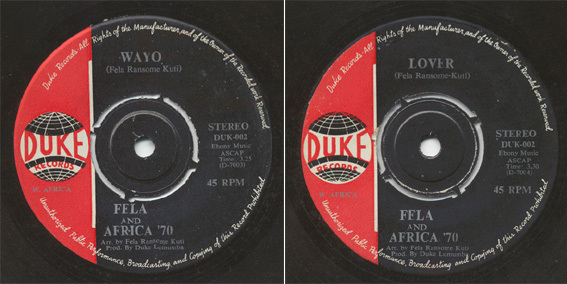 Information for these Duke singles was proveided by Miles Cleret. These tracks were later included in the compilation CD, 'The '69 Los Angeles Sessions (CD UK (1993), Stern's STCD3005)'. -- This is the original LA Session album released in Nigeria! Lonnie Bolden plays tenor sax, jacket design by Ebele and Chinye. A Duke Lumumba recording in February 1970 in LA, but was released in 1971 after Fela came back to Nigeria in March 1970. -- UK re-issue of the EMI album in the format of CD from Stern's in 1993. The title is misleading since the recording session was held in February 1970. -- Image, courtesy of Miles Cleret and Andrew Symington. -- Image, courtesy of Miles Cleret. - Image is shown here by courtesy of Naotaka Doi. [A] Beautiful Dancer / Jeun Ko Ku (Chop and Quench) (Part1& Part 2) / Black Man's Cry. [B] Na Fight O (Part1& Part 2) / Who're You? -- Information provided by Miles Cleret. -- This track was later included in the CD 'Roforofo Fight / CD Singles' (CD France (2001), Barclay 549 380-2). -- Image, courtesy of Miles Cleret. 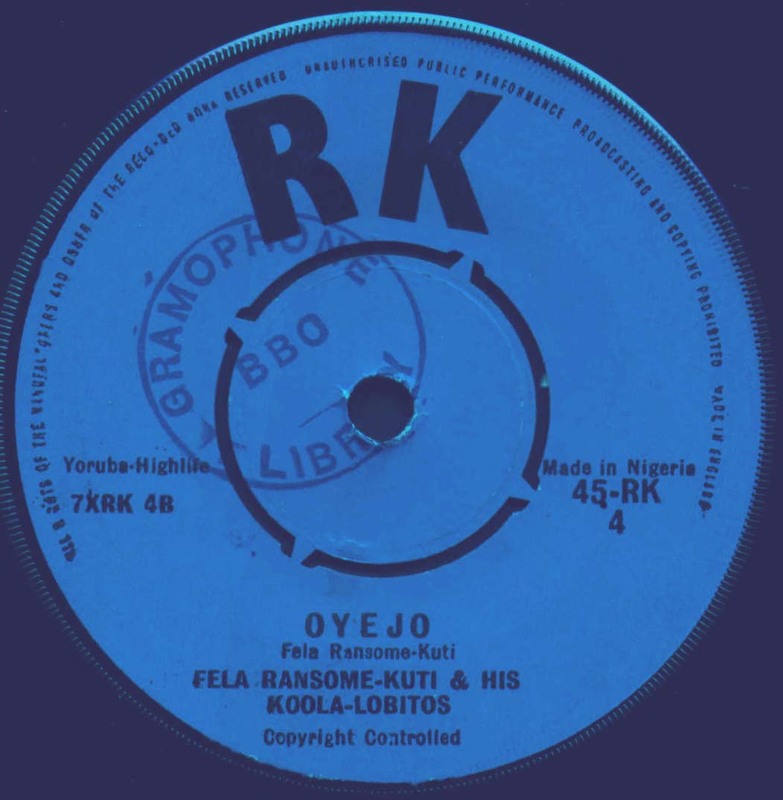 This single version is different from the album (He Miss Road) version, and has been re-issued under the name of Fela Ransome Kuti and the Africa 70 from the KFR label (2011; 7" US, Knitting Factory Records KFR1114). -- This track was later included in the CD 'Afro Baby / The Evolution of the Afro-Sound in Nigeria 1970-1979' (CD UK (2004), Sound Way SNDWCD002). -- Low-priced compilation album released only in Nigeria. The photo of the jacket appears by courtesy of Michael E. Veal. --The right picture is taken from the inner side of the original fold-over jacket. The president of Ghana, Col. 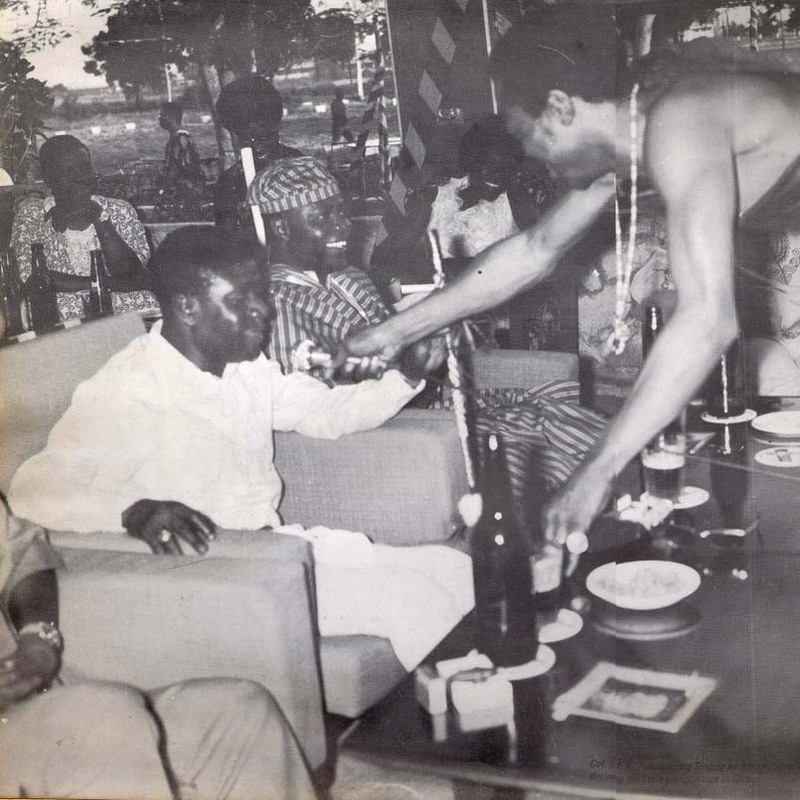 I. K. Acheampong is singing an African song with Fela during the State performance in Ghana. -- Also released in UK as a single "Egbe Mi O b/w Chop & Quench" (7" UK, Regal Zonophone RZ 3052) in 1972. 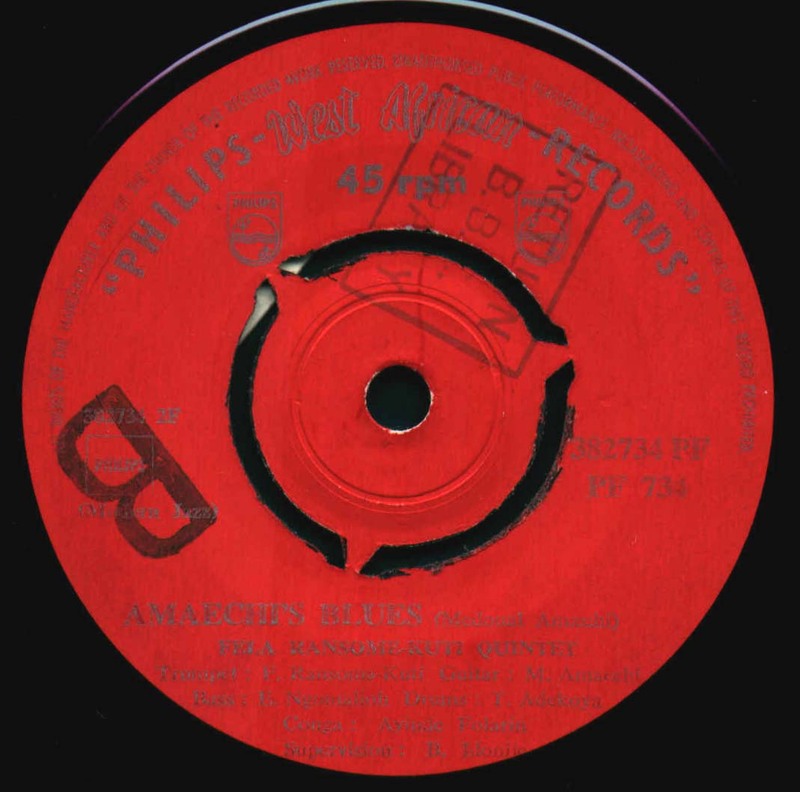 -- An edited version of 'Shakara' was later released in two parts as a single (7" UK, Creole CR 105) in UK in 1975. -- The photo of the jacket appears by courtesy of Deen Ipaye. -- Image, courtesy of Miles Cleret. 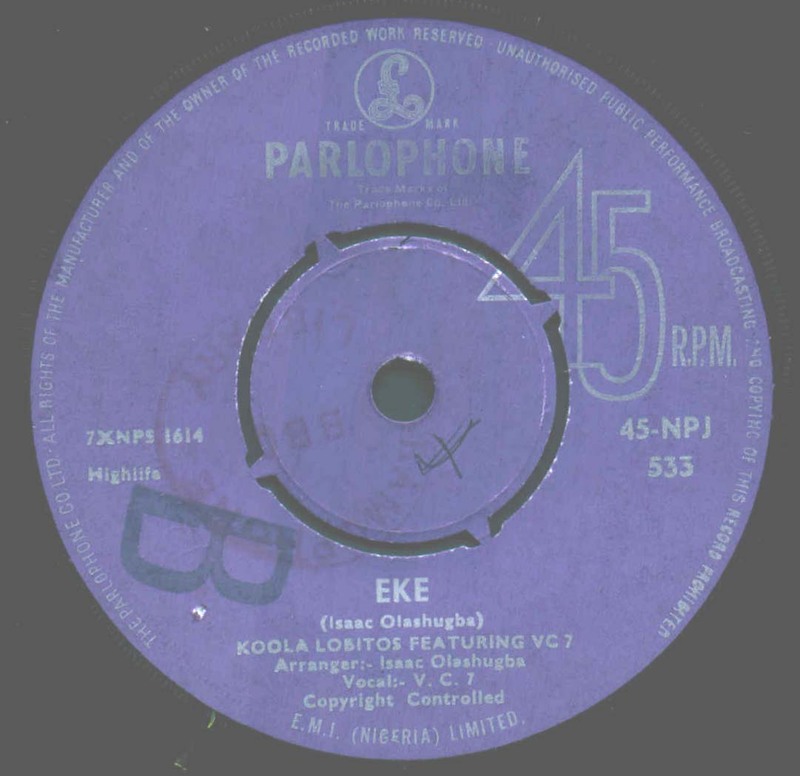 Although the release year is not indicated on the disk, it has the orange EMI label that was introduced in 1973 when the Gramophone Company changed its name to EMI Records; prior to that, the records had the HMV label (Uchenna Ikonne). -- Prod. by Ginger Baker. The name of the track 'He No Possible' was changed to 'It's No Possible' in the Stern's-version LP. The photo of the jacket appears by courtesy of Michael E. Veal. -- Although there was a rumour that this album was originally released on EMI in Nigeria. However, this was not the case, and Chris May kindly confirmed this fact. 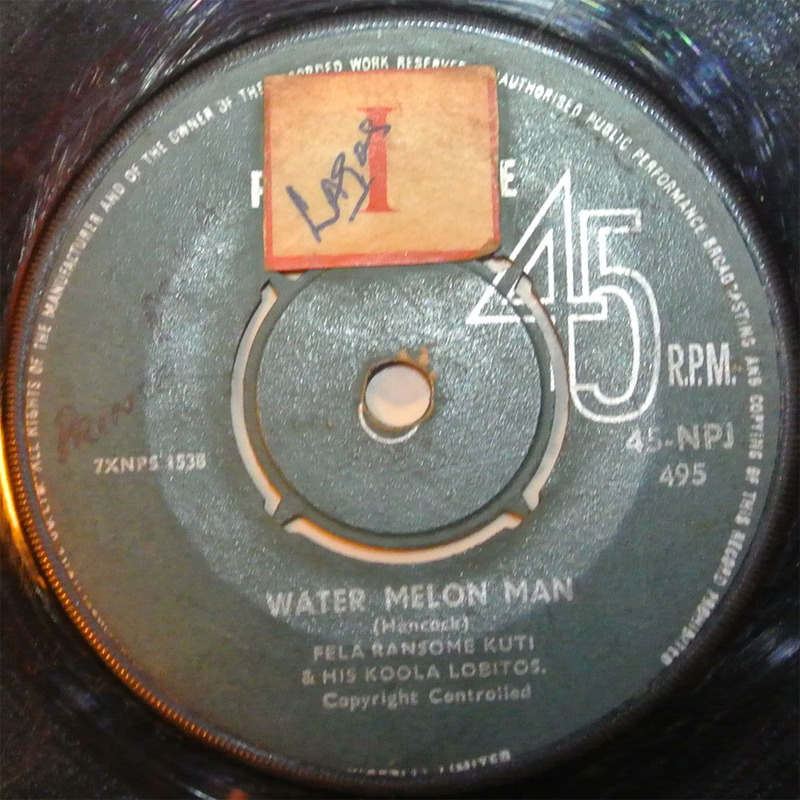 On the label of this album, 'Kalakuta Show' was indicated as 'Kalakuta', and 'Don't Meke Garnan Garnan' as 'Te Je JE' as shown below. This was pointed out by Greg Villanova and Bosajide Bello. Thanks! -- "Go Slow" is a different song than the one on "Roforofo Fight". -- The cover has the caption 'Featuring Black President Fela Anikulapo Kuti, also featuring John Collins'. 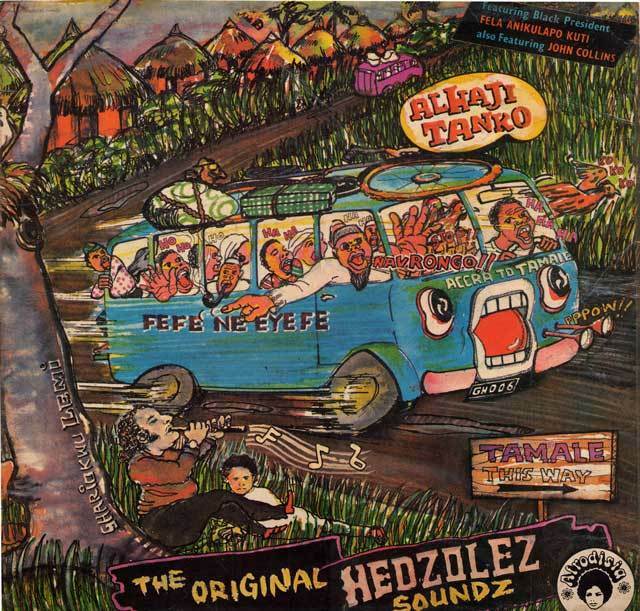 Hedzoleh recorded at least three times: twice in Lagos around 1973, once on their own (Nigeria EMI) and once with Hugh Masekela (Blue Thumb). The EMI recordings will be re-issued soon by Miles Cleret's Soundway label. Then in 1976, Faisal Helwani (he is stting at the bottom of the Hedzoleh cover, playing a flute) set up a band called New Hedzoleh after the original one broke up in the States. The new line-up was probably Kris Bediako (g), Joe Miller (g) and others. So the Hedzoleh album with Lemi's artwork should be edited from those recordings. However, this album has been a kind of lost album for a long time and Fela's participation, although likely, was not yet confirmed. I thank Demian, Lemi Ghariokwu, Miles Cleret, and John Collins for the information. -- Fela plays sax on 'Dr Solotsu'. The cover has the caption 'Featuring Black President Fela Anikulapo Kuti'. Information provided by Miles Cleret. -- According to Decca, 60,000 copies of 'STB' were waxed in the factory in London in 1977, but were not released because the company had been advised (by the Government) after the incident of February 18, 1977, that it was highly seditious and an offence. However, according to Fela, he later confirmed by writing to the Inspector General of Police that there was actually no ban on 'STB'. (The Punch, Sept. 2, 1978). The original jacket by Ghariokwu Lemi (zgmanagement@lycos.com) appears by courtesy of his productions. -- This album was re-issued on a 2 on 1 format of CD (Honest Jons Records HJRCD 101/2) in 2004. -- Most likely, released after the Decca House incident (July - September, 1978) in 1979. Observation No Crime (LP Nigeria, Decca Afrodisia DWAPS2037; recorded but unreleased. -- 'Observation No Crime' was later included in the CD 'Zombie' (CD France (2001), Barclay 549 383-2). The title was changed to 'Observation Is No Crime'. Although Mabinuori Kayode Idowu describes in the note of the CD that this track was recorded live at the November 1978 Berlin Jazz Festival, the track was actually recorded in the Decca studio in 1977! --'Perambulator' was later released in Nigeria in 1983. The tracks recorded live at the November 1978 Berlin Jazz Festival are contained in the following CDs. -- Fela appeared in 'Pansa' (C6), which is likely a live version and is different from the original studio version ('Pansa Pansa' in the 'UG' album). --Containing an extra ordinary issue of YAP News (July 1980) featuring the 2.8 billion naira oil scandal in Nigeria. --"Lady" is shortened and edited. "Unknown Soldier" includes only the vocal portion of the original release. 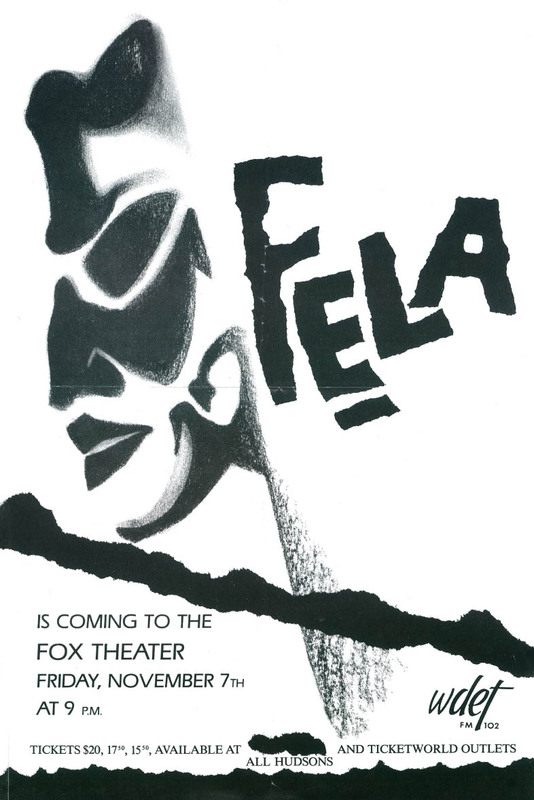 -- Limited edition for Fela's European tour in 1984. Produced by Fela. -- Original version and prod. by Fela. -- 'Government Chicken Boy' is the previously unreleased, original version. -- Remixed version and prod. by Fela and Bill Laswell. -- Reissue of older material. 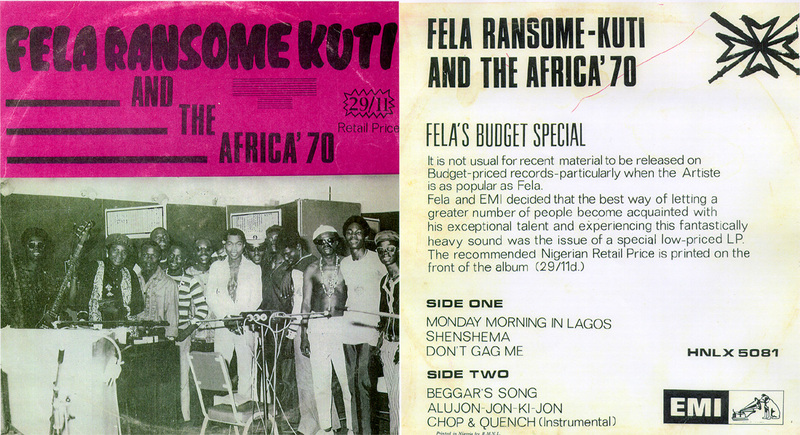 -- These tracks were taken from 1977 recordings, without Fela's permission. --- Reissue of old recordings. -- "Were Oju Le" was recorded with Fela and some musicians from his band, probably Egypt 80. Although the credit indicates that male singers are "Africa 70" and therefore "Were Oju Le" could have been just sung over an old unreleased Africa 70 instrumental track, the track sounds more like Egypt 80 than Africa 70. Indeed, the musicians look more like Egypt 80, too. -- According to Carter van Pelt, Michael was working with a producer, Lister Hewan-Lowe, at the time (86) who knew Fela and they brought him in for a sax solo on 'Just Do It'. -- The artists included are Salif Kieta, Dede St. Prix, Fela Kuti, Ray Lema, Buckwheat Zydeco, King Sunny Ade, Los Van Van, Kanda Bongo Man, Ntsikane, Joe Arroyo Y La Verdad, Malombo, Boukman Eksperyans, Soul Brothers, Baba Maal, Irakere, Abdullah Ibrahim, Oscar D'Leo , Malathini & Mahotella Queens. -- Although the CD version of 'US' contains both the instrumental part and the subsequent vocal part, the Nigerian LP version of 'US' contains only the vocal part and lacks the preceding instrumental part. -- Compilation of older material. The track labeled "Black Man's Cry" is actually "Eko Ile" from "Afrodisiac" (EMI Nigeria 062). "Shuffering & Shmiling" is only the first, instrumental part of the song. -- Fela played organ and produced the album. Both tracks were originally recorded in the late 70's, but had not been released until 1995. 'Se-rere' was included in the compilation CD 'The Original Afro Beat: The Sound of 90's Nigeria' (CD UK, Aladdin Records ALA 212) in 1999, and the entire album was also re-issued on a 2 on 1 format of CD (Honest Jons Records HJRCD 101/2) in 2004. -- `Vernacular' and 'Put Am Well Well' feature Fela's monolog etc. 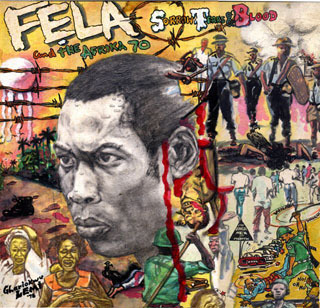 -- Great Fela Kuti tribute album including remix of Fela's original tracks and performances. -- Mixed by Chief Xcel of Blackalicious. 11 album tracks taken from Fela Kuti's Africa 70, Egypt 80, and Koola Lobitos lineups. Exective producer, Paul Heck. Equalization Of Trouser & Pant / J.J.D. --This is an amazing CD set released and distributed only in Nigeria. Although this is not a complete set of Fela's recordings, of course, it contains 150 golden tunes i.e. 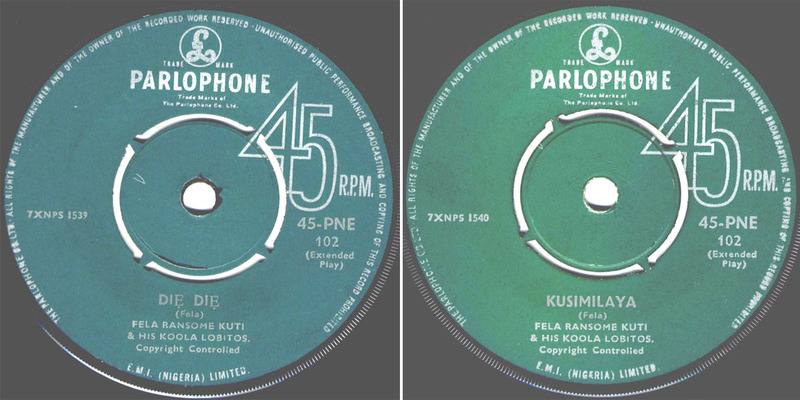 46 Koola Lobitos-related tracks and 104 Fela Ransome or Anikulapo Kuti's tracks. But what is really amazing is that it contains several previously unidentified tracks! 'Yabons Ke Lele' on disk 3 seems to be "Die Die" and "Ekuro La Labaku Ewa" be "Kusimilaya" (both were released as PNE102). Koola Lobitos's 'Ekuro La Labaku ' on disk 2, and 'My Dog & Cat' and 'Yabomisa' on disk 4 are previously unknown tracks, which may have been released as a single. Fela Kuti's 'Stranger (Alhaji Alhaji)' on disk 40 appeared previously only on a bootleg CD as 'Music Against Second Slavery'. This information and image file were provided by Kazuya Ogiwara, who corrected errors in the track listings on the package. Deen Ipaye is also helping me to correct the track listing. Thanks a lot! -- This track was taken from the unofficial live recordings called 'Fela at Lekki Beach, 1994', which included 'Chop and Clean Mouth, Like Nothing Happen' and 'Music Against Second Slavery' as well. The jacket artwork was also pirated from the 'Open and Close' re-issue album designed by Ghariokwu Lemi without his approval. --A new documentary DVD taken in NYC from Greenwich Village to Harlem. - Long awaited new release of Fela, which was previously available only as a personal recording. 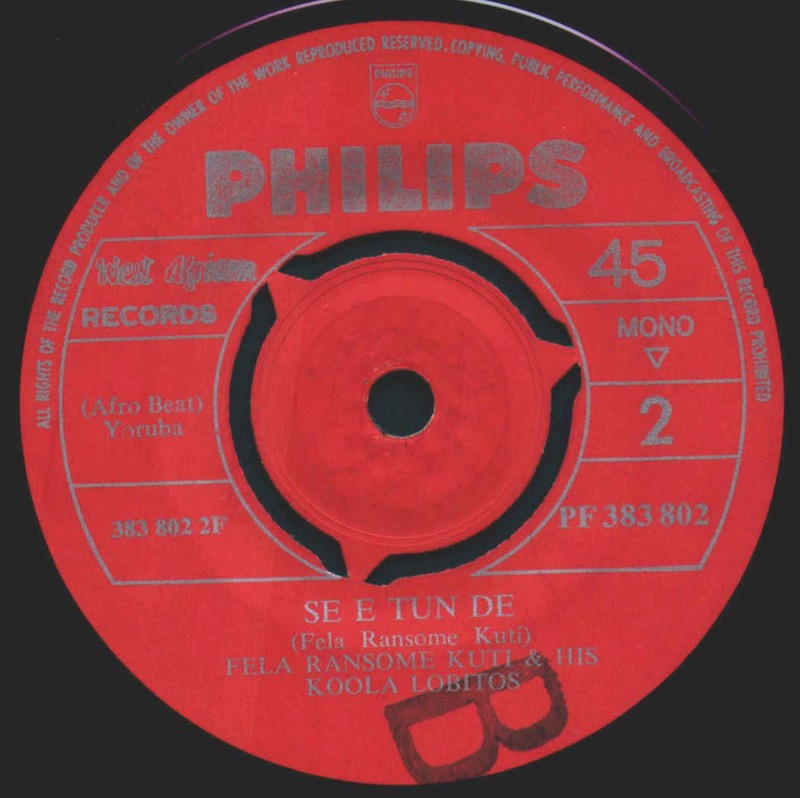 'Se Rere', which was performed as an opening number, was cut in this release, but other tracks are included as complete forms. Recorded at the Fox Theatre, Detroit MI, on November 7, 1986. Original master recording by Bob Teagan and the Wendy Hour. The poster replica, courtesy of Braian Long. According to Michael Veal and Olajide Bello, the following songs have been often performed, but have not been recorded yet. This song was performed in his early days. 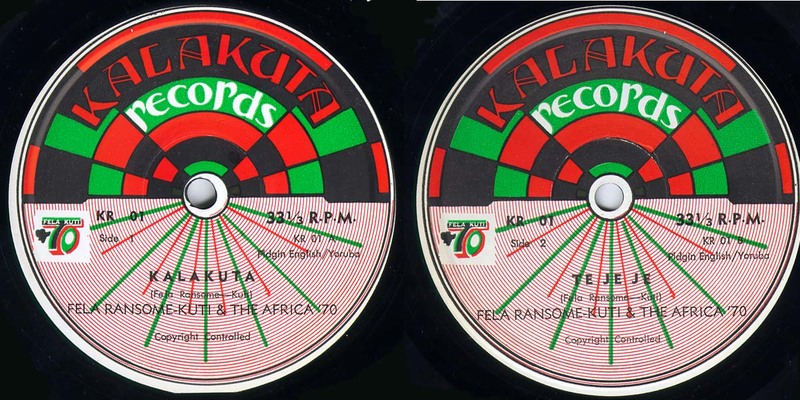 -- According to Miles Cleret, this afro-beat song was recorded by Jerry Hansen (Leader of the 'Ramblers dance band' [Ghanaian Highlife]) on a single from Editions Makossa (7" 45; Editions Makossa EM2722A, 1975). The B-side is 'Neya Waye Me', a cover of an African Brothers track written by Nana Ampadu. -- Special Thanks to Yoshiki Fukasawa, Michael E. Veal, Ray Templeton, Deen Ipaye (http://felakuti-lyrics-and-pidgin-english.blogspot.com/), Dr.John H Cowley, John Beadle, T. Ajayi Thomas, Olajide Bello, Greg Villanova, Carter van Pelt, Steve Mereu, Carlo C. Brander, Miles Cleret, Michael Kieffer, Paul Heck, Duncan Brooker, Andrew Symington , Kazuya Ogiwara, Patrick Mund, Naoki Ienaga, Carlos Moore, John Collins, Rikki Stein, Brian Long, Markus Coester, Uchenna Ikonne, Paul Cleugh, Chris May et al. Last updated on February 1, 2018.